I am sure I’ve posted a roasted chicken before but today’s was so tasty I must share this recipe. Just a simple thyme and lime combination that added so much flavor. It always amazes me how well citrus flavors go so well with poultry and really shine through. Pat chicken dry and season with thyme, salt, and pepper. Squeeze a bit of lime juice on to chicken as well and place remaining lime inside cavity. Bake at 375 degrees for about 1 1/2 hours. 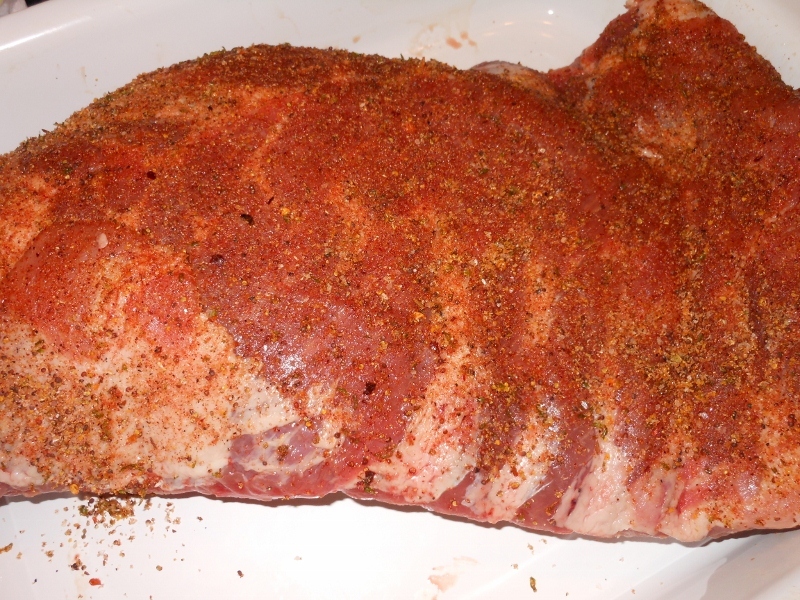 Allow to rest for 5 – 10 minutes before carving. This is the fish I made with yesterday’s flavored salt post. I loved this; so much so that all I could think about was making so fish tacos with it next time. Season perch with cilantro lime salt on top side. Heat olive oil in medium – large skillet over medium heat. Add fish seasoned side down and cook for about 3 minutes; flip and cook an additional minute or two until cooked through. Serve with rice and salsa. I keep seeing stories and recipes for flavored salts. I thought I would give a few a try; today I went for a cilantro lime combination. I made it when I was ready to use it so I didn’t worry about the moisture from the lime zest or cilantro; I do think I will make a batch ahead and dry it out though to see if it hold the flavor as well as the fresh did. In herb grinder (I used a coffee grinder I picked up just for these herb salts) combine all ingredients and grind together. This made the perfect amount for the pound of fish I was fixing for dinner. Very green color and it imparted the flavors into each other very well. I wouldn’t have expected this much difference between grinding everything together and just using each on its own but it definitely made a great flavored salt. I can think of so many things this would be good on or in! Can’t wait to use it again. 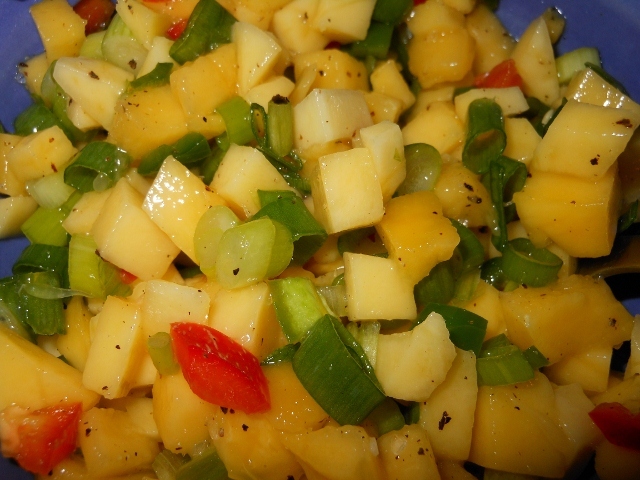 So, I have made mango salsa before. 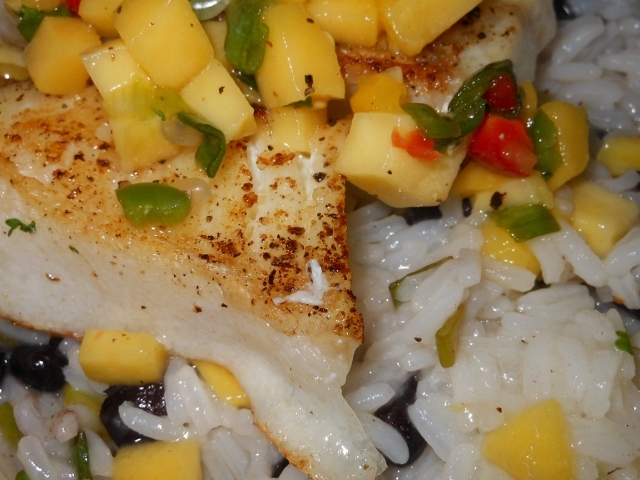 We’ve served it over tilapia for a simple tropical flavor but I don’t think I’ve ever enjoyed it as much as the recipe I made today. I added jalapeno for a kick and cilantro for contrast. My mango was even a little under ripe so I was worried it wouldn’t give enough flavor but it was amazing. This is perfect for fish recipes. I actually used some of it for a rice dish today and served with halibut, but I will simply post the salsa as is because I do believe it will be amazing on chips too. Peel and chop the mango. I will have to do a post soon of the easiest way to do this; mangos have a flat large seed in the center. Combine all ingredients in bowl and set aside for 3 minutes for the flavors to marry. 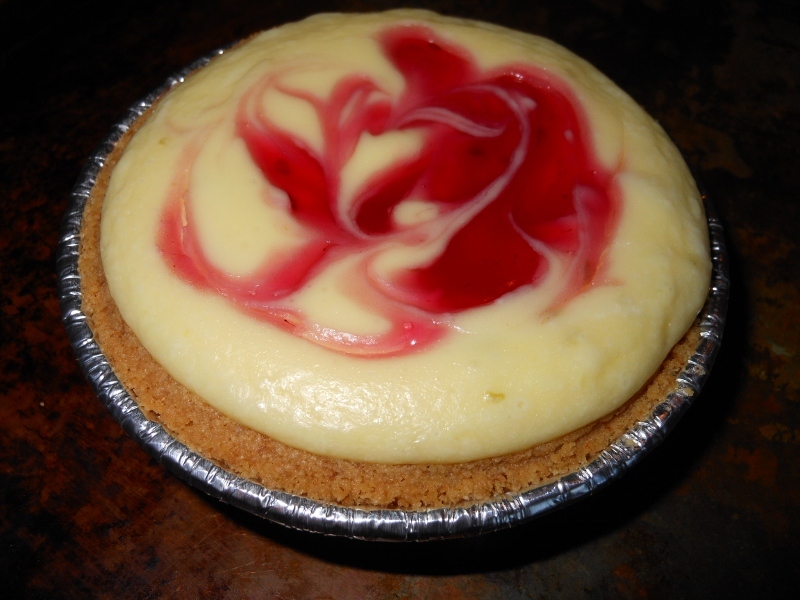 I did put part of my blackberry sauce to work today; the cheesecake came out perfectly. I cheated a bit and used pre-made mini graham cracker crusts, but delicious none the less! I made 6 little cheesecakes and still have plenty of blackberry sauce to spare. 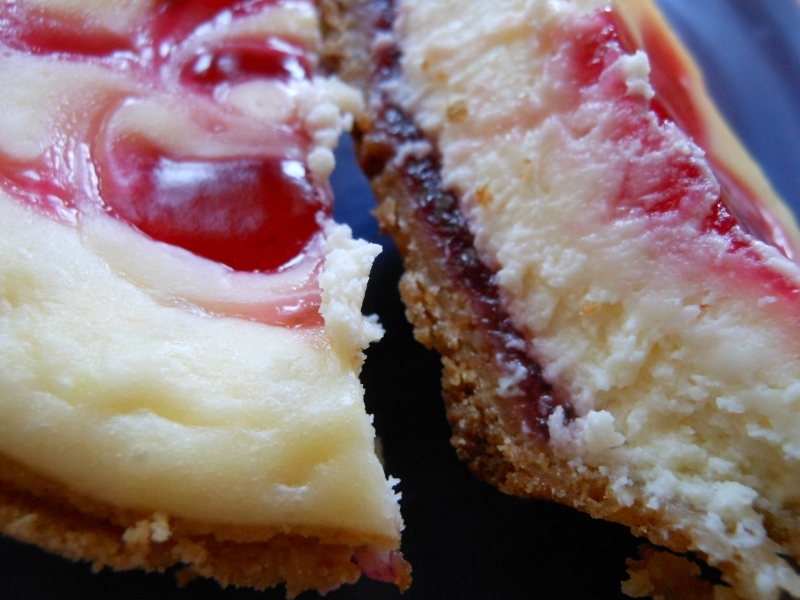 If you don’t want to make the sauce the cheesecake recipe could be adapted for pie filling, jam, or freezer preserves. Combine cream cheese, sour cream, sugar, lime zest, and lime juice. Once combined mix in egg. 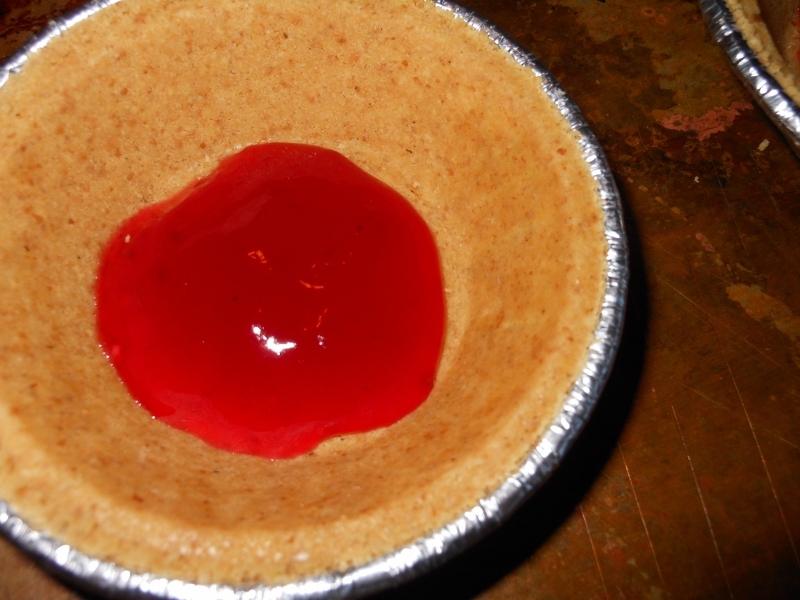 Place about 1 teaspoon blackberry sauce in the bottom of each prepared crust. 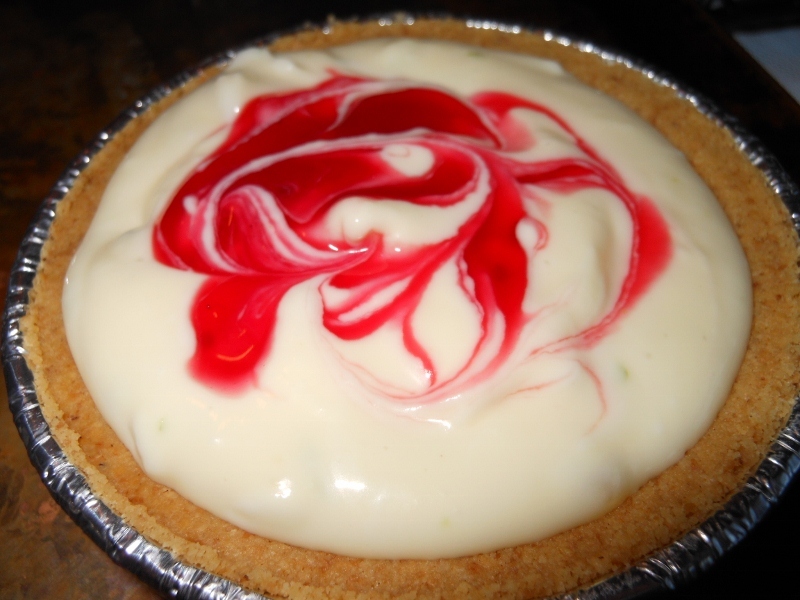 Divide cheesecake batter among each and add an addition 1/2 tsp sauce to the top of each. Using toothpick swirl jam in random pattern. Bake at 350 degrees for 20 minutes or until just set; cool on wire rack. Refrigerate for at least and hour before serving. 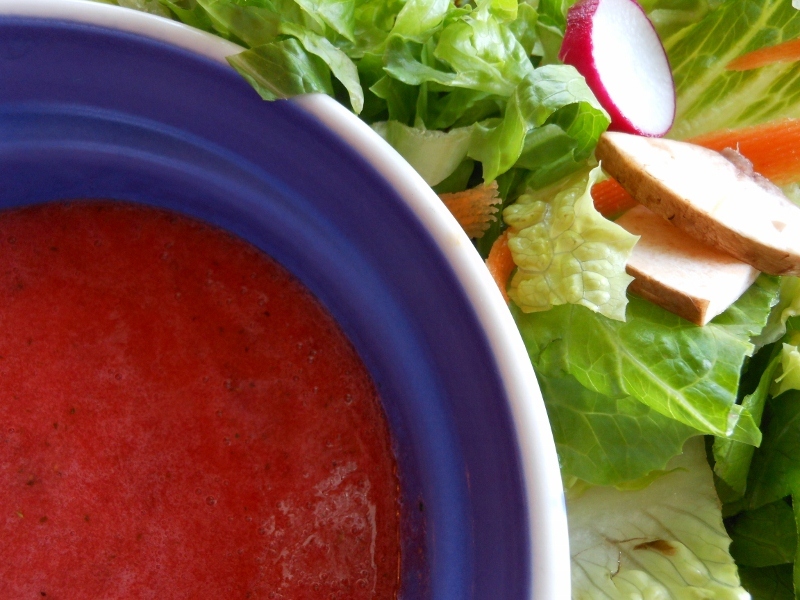 Ok, so making a fat-free dressing isn’t my first intent but for some reason I am not a huge fan of all the oil that is in a true vinaigrette. While making a raspberry dressing the other day I grabbed my cooking olive oil vs. the extra virgin type; I was so disappointed when I tasted what was starting to be a super combination. Ergo my oil-less dressing was created. I often use just balsamic vinegar on my lettuce anyway so no oil just makes sense. 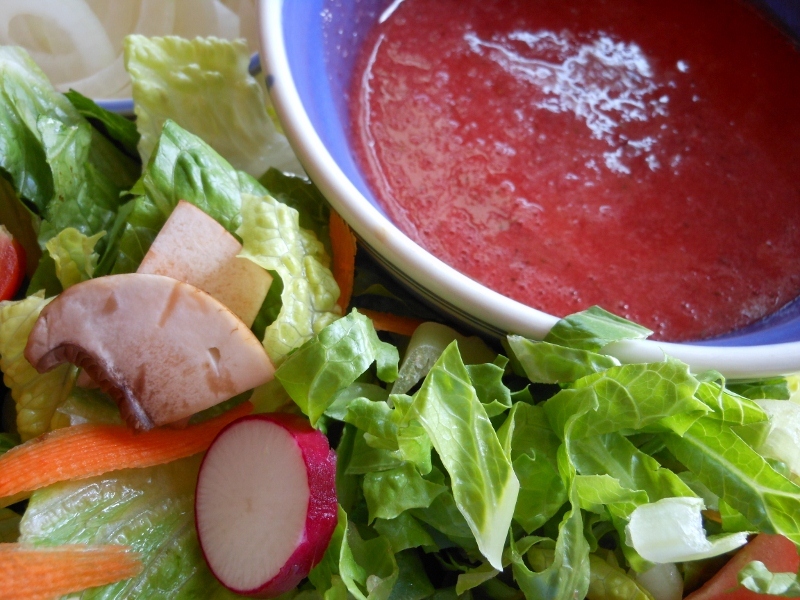 We enjoyed our tossed salad with romaine lettuce, locally grown radishes, tomato, carrot, and mushrooms. We also added some avocado to our salads; it just seemed like a natural addition with the cilantro and lime. In blender combine all ingredients. I strained my dressing through a metal sieve. Some of the seeds still slip through and of course you lose a bit of the pepper and cilantro but it keeps most of the seeds at bay if you are sensitive or just don’t feel like contending with them in your teeth all day! I thought I’d try a different twist on my cream cheese dip tonight. I decided to go with a southwestern flair; cilantro, lime, and jalapeno just sounded tasty. 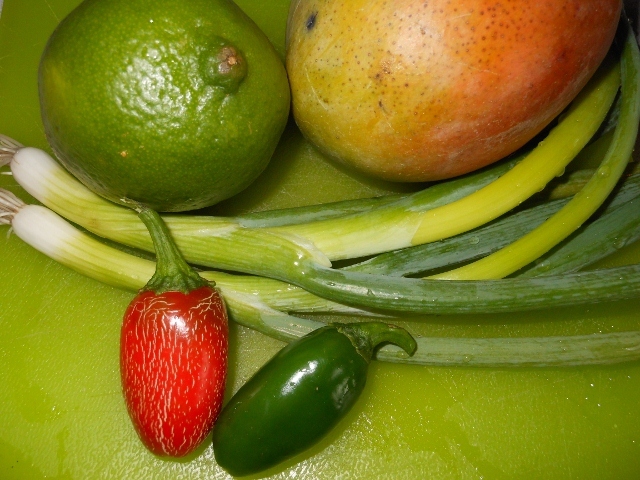 The sweetness of the red pepper and the tartness of the lime worked very well with this spicy combination. I don’t think I would change a thing. I couldn’t decide if bread or tortilla chips would be better; I tried both but enjoyed the crusty toasted baguette the best. 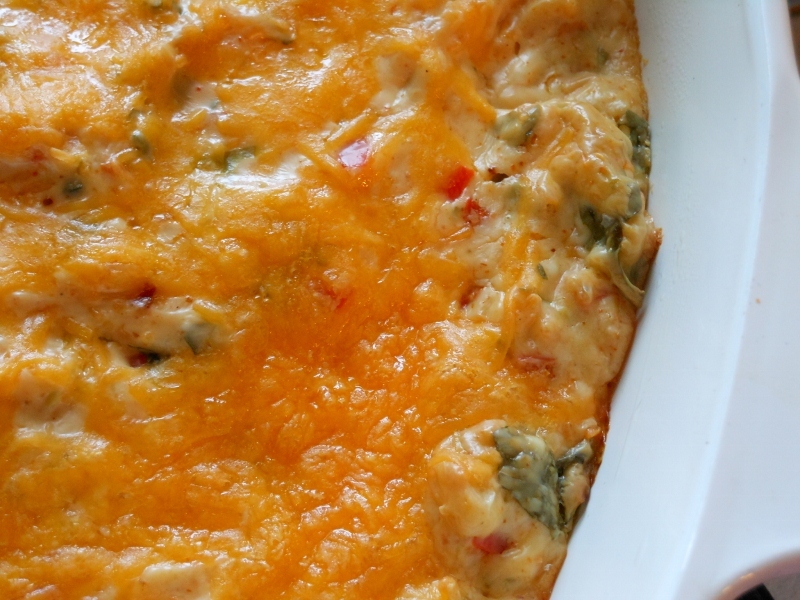 This can be made ahead and baked just before serving. It also reheats very well should you be lucky enough to have leftovers! Allow cream cheese to soften at room temperature for about an hour. 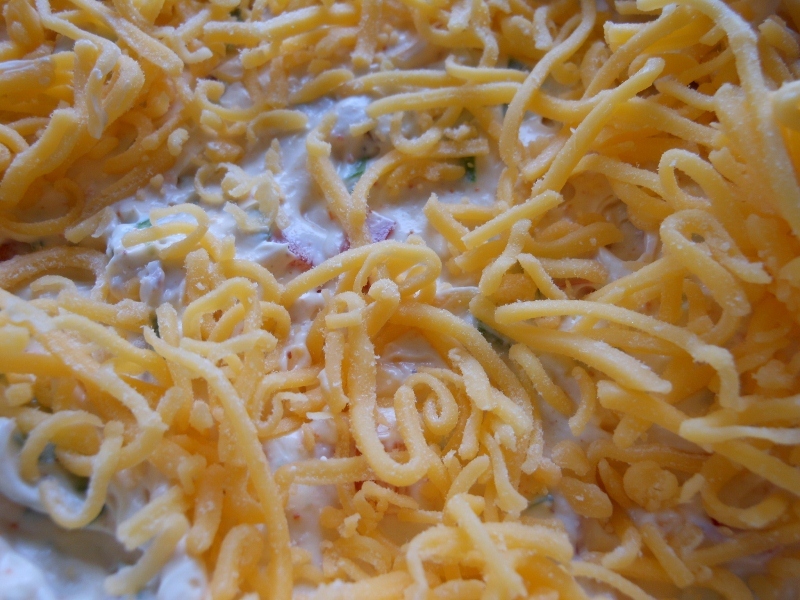 Mix in sour cream and mayo until fully incorporated. Add pepper, jalapeno, onion, lime zest and juice, chili powder, 1/2 cup of cheddar, and cilantro. Spread into small buttered baking dish or pie pan. Top with remaining cheddar cheese. Bake at 350 degrees for about 30 – 40 minutes until hot and bubbly. So I have been talking for the past two days about my ribs. I liked the rub, could have maybe been spicier and maybe I should have used more; I did after all have over 5 pounds of spare ribs. The sauce however balanced out the spiciness perfectly. As I mentioned in my first post I baked these; not my usual choice for ribs but I needed something I could do unattended for several hours without worry of my fire going out or the meat being over cooked. I like to use onions as a rack for my ribs. 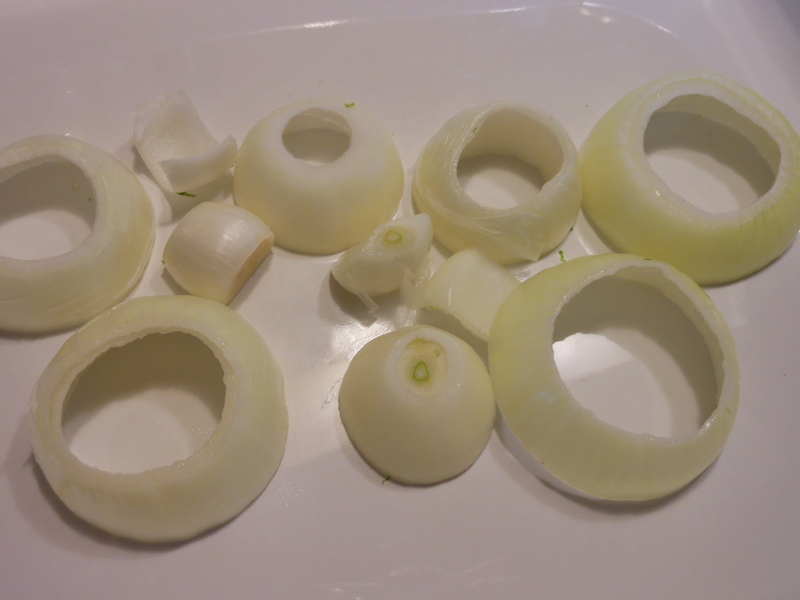 Place onion slices on the bottom of baking dish. Season meat with rub and place in baking dish on onions. Pour corona into bottom of pan reserving 1/2 cup for sauce (or open an extra corona if you need); squeeze lime juice into pan also. Cover with foil and place in 225 degree oven. Meanwhile prepare sauce. Roast for about 6 hours. Remove ribs from oven and set aside. No peaking for at least 30 minutes. 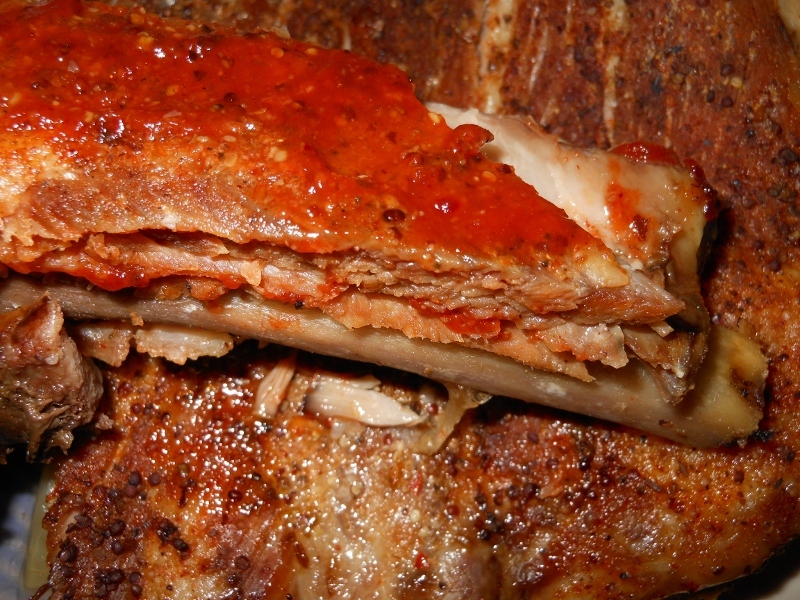 Baste ribs with sauce if desired and broil for about 6 minutes.